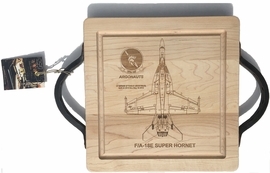 The VFA-2 "Bounty Hunters" cutting board has not been photographed yet but is similar to the VFA-147 cutting board. A F-14 Tomcat or legacy Hornet version is also available. We can send you a proof before we make the actual cutting board. The artisan boards are made from hard rock maple. Some variation in color and wood grain is part of the natural beauty of our spectacular boards. The handle are wrought iron.